This Chikuhodo Artist 18-2 brush is now discontinued as a Chikuhodo line but will be kept by Chikuhodo as an OEM line for other brands, it appears now in a different section. I recently spotted the R-C2 that has just been released and I have to say the shape of the head looks exactly similar… => the difference is now explained at the bottom of this post in the update since Chikuhodo replied to me with a bit more details. 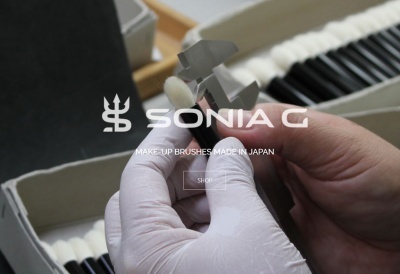 Here we are in Sonia’s Heaven territory, whatever material, this is the shape that makes me want a brush really really bad! Round, soft, dense but not like a mass of hair, just directional enough to place and blend precisely without leaving streaky lines, you’ll have a huge lot of control without having to worry about an uneven application. It’s funny because even though it’s very dense, the application of very pigmented blushes, like the Tom Ford Flush or even Narcissist, has a very natural finish. 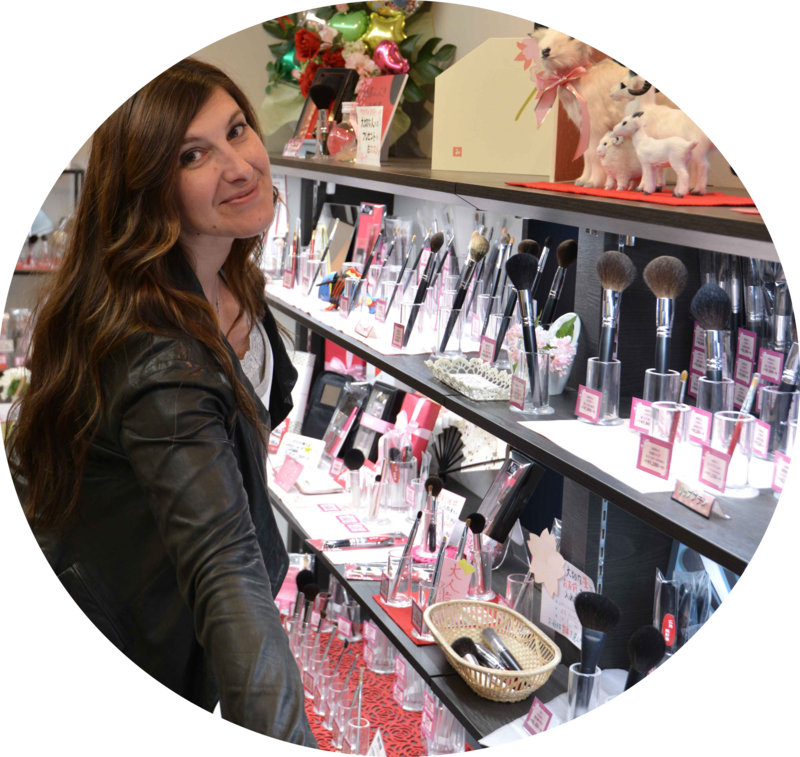 It does also pick a great amount of product on sheer blushes like some Burberry or SK-II that I love, I apply the blush in circular motions starting in the center and blending outwards and I can repeat the operation and build up without having to correct it. I also like to push the powder like that because I feel like the blushes last longer than with a swipe type of application. The GSN-04 is similar but bigger, not as soft but it is very easy to use, works with any product and has a huge talent for blending. It doesn’t poke at all but in terms of softness, it does not compare to the 18-2 at all, the later being so much softer. The Hakuhodo 210 is shown here for size comparison purposes, actually, the 210 is a brush I was really wanting in squirrel hair, but that I could not get my hands on. I believe the 18-2 is the closest you could find. The density is probably similar but the flexibility of the 18-2 is bigger due to the hair being softer and longer. The Tanseido is a fantastic brush too, but better for very pigmented products because it’s really not as dense as the others. This 18-2 has everything that I felt was missing in the other ones… I wanted a softer brush than the 210, a more precise brush than the GSN-04 and a denser brush than the Tanseido and with the 18-2 I have it all. Well, except for the handle, I wish it was a little bit more unique. But believe me, in terms of quality vs price this 18-2 does meet my picky requirements. The Chikuhodo Special does have it all too… Since I received many emails asking me how and where this brush can be obtained I tried to find you a dupe. The Special portable brush is the same idea in terms of shape and I think a few of you are interested because of that, and you should be because for once you have a portable brush that is gorgeous and useful. This exact brush can only be purchased in Hiroshima in the local shops but I found two brushes that could be dupes (however without the flower design) : The Eihodo H-5 and the Chikuhodo H-5. Chikuhodo told me that the R series have the same concept as the Artist series. Some of the R brushes have same bristles as the Artist, overall quality-wise the R may be higher. Seeing the quality of the 18-2 I don’t see how the hair could be better… it might be related to the handle. Will keep you posted on that. The Artist series have been discontinued as a Chikuhodo line and are now only provided as an OEM line. The R range will be provided as the Chikuhodo’s original line. Chikuhodo Artist 18-2 was last modified: September 24th, 2014 by Sonia G.
While I was there, I FINALLY caved on the MK-2. It will be my first Makie brush!! Either way, you won’t have regrets in my opinion even if you have two because it’s very multipurpose, I was going to get a second one but since the R-C2 is similar I’ll wait for it and see. Last Saturday i received the chikuhodo Artist 18-2. The head is very round and a tiny bit too big for my little cheeks. It is very soft and at the same time dense. With my heavy hand I can apply any blush and the result is always gorgeous. But sorry chikuhodo, the Tanseido YSC is still my favorit blush brush. But the second rank is safe. Hi Kimitrulla, gosh that’s right you are a Tanseido YSC devoted fan! I understand you totally, it is fantastic if you have a heavy hand! Second rank is nice and you may want to use it with sheerer blushes for example… hope you still be using it either way! Looks like an excellent brush for contouring! I have the Haku 210 (was my first Haku purchase) but it sheds and bleeds blue dye, so I don’t really find myself reaching for that brush that often. You really do have an exquisite brush collection! That was my thought too! And I like it better than the Hakuhodo J210, because it is more tapered and therefore has a smaller surface at the top. I think chikuhodo made a separate website for their artists/wholesale brushes from their prestige line. I dont understand but all I can see is “OEM” hahaha Anyway, here is their website for their artist series brushes and they still have the 18-2 brush. Im sorry instead of “prestige”, it should be their Original line. The website for the original line and the standard line are separated. Ok! I will wait for your RC 2 post. Does it also work for soft contouring? yes absolutely, sorry I forgot to mention… but indeed, it’s also fantastic for that, I’d rather use this than a very dense and flatter brush, this is much more forgiving and easy. Which brush did you have in the stoplight last week or so? last week it was the Koyudo C011 but I will create some archives so that you can follow up if you missed it 🙂 sorry !! What did you ment by “does not appear in the Chikuhodo website”, is not it this brush: http://www.chikuhodo.com/oem/list/artist/artist_18_02.html# ? I have sent an email the other day to Chikuhodo about this and I am just awaiting confirmation from them that these series will not be discontinued. I will keep you updated as soon as I receive more information. I apologize for the confusion ! So.. got a reply from Chikuhodo. The artist series will be discontinued by Chikuhodo as their own line but the range will still be available to other OEM client companies. Thank you! Would keep that in mind. Thank you Amy 🙂 are you looking for a small size round -flat- blush brush ? I can think of big ones but not much small options are available, that’s why either Tanseido or Chikuhodo are quite the leaders on this type of shape.. I love the Artist 18-2, R-C2, Noel Collection, GSN-04 comparison post on fb 🙂 thank you so much, Sonia! yes they might be the same 🙂 Chikuhodo now make them for other brands, probably that these may come from there. 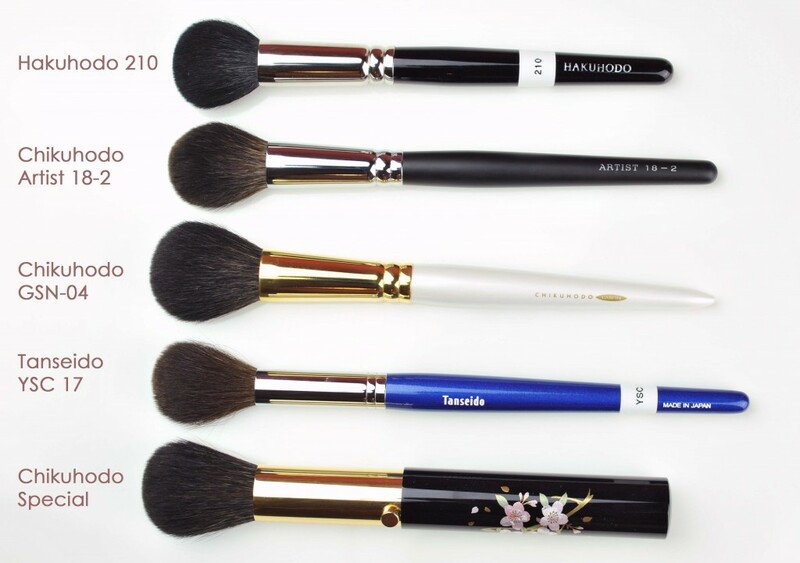 I love brushes in this shape as well, just wondering what’s the differences in between the Chikuhodo Artist 18-2 and the Z series Z-4 cheek brush?? they look pretty similar in size in the photos, only thing i notice is the Artist 18-2 is rounder and the Z-4 if more flat in shape, but in terms of their softness, application quality and the size, do them have major differences?? thanks for every sharing you did in the blog btw. cheers. I have similar concerns…I’m choosing from haku J210, Chikuhodo GSN-4, and Z-4 for cheek brush. It seems that J210 is rounder, Z-4 is flatter, and GSN-4 is in between. Since All of them are soft enough for me, I doesn’t care much about the softness of the bristle. But their shapes are a bit different, I really can’t decide which one to buy…Would you mind offering me some advice? Btw,I already got the Haku B110 so don’t want brushes that have similar effect as B110. Thank you! Hi, how does chikuhodo 18-2 compares to suqqu cheek brush? I already have the suqqu one and I’m thinking about buying the chikuhodo one as a dupe? Are they similar? I think maybe the chikuhodo one is denser?